Accurate weighing of gold chains, necklaces, bracelets, jewellery, precious metals, gemstones, etc. When reliability and accuracy are important, a quality OHAUS Scout SJX jewellery scale will perform, at an affordable price. 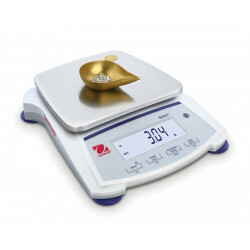 Available with an internal calibration weight for calibrating your jewellery scale before weighing in the field. Accurate jewellery scales designed for weighing jewellery, precious metals, gemstones, etc.Slim design with large backlit LCD display Fast weighing speed and high resolution Superior overload pr..